Warner Bros. Studio Tour Hollywood (WBSTH) announces a new addition to the Studio Tour in celebration of Warner Bros.’ 95th Anniversary. 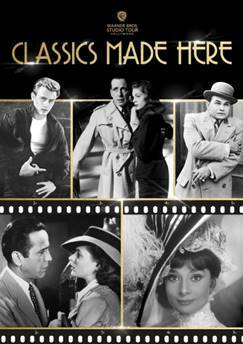 Beginning May 4, the Classics Made Here tour and exhibit will take guests back to Hollywood’s Golden Age with a tour focused on award-winning titles that have shot on the iconic Warner Bros. Studios backlot throughout the ages. Each tour is led by a specially trained guide, whose passion for TV and filmmaking includes extensive knowledge of Warner Bros.’ classic library titles ranging from Casablanca, My Fair Lady, Rebel Without a Cause and TV shows such as Maverick, The Waltons and Batman plus many more. The two-hour intimate tour concludes at Stage 48: Script to Screen, where guests enjoy exclusive access to never-before-seen costumes and props from some of their favorite movies in the Classics Made Here exhibit. The Classics Made Here tour starts with a champagne toast to celebrate the legendary history of Warner Bros. Guests will then board their carts to visit famous backlots, historic sound stages and many of the studio’s most famous landmarks. While no two tours are alike, this unique experience brings guests back in time to Hollywood’s golden age to re-trace the steps of Hollywood legends, hear stories from behind the studio gates and learn the history of how Warner Bros. revolutionized the entertainment business. “Our Classics Made Here Tour and Exhibit highlights all the aspects of old Hollywood and brings our guests closer to the classic films and shows they love. We are thrilled to be able to add this new experience to our lineup of tours and give even more reasons for fans to come visit us,” Gary Soloff, WBSTH Director of Marketing, said. At Stage 48: Script to Screen, the Classics exhibit pays homage to the legacy of Warner Bros.’ footprint in Hollywood and, for the first time, offers a close look at rare, never-before-exhibited costumes straight from the films that memorialized them on the big screen. The exhibit features a re-creation of the Ascot Race scene from My Fair Lady with a costume worn by Audrey Hepburn and imagined by Oscar®-winning costume designer Sir Cecil Beaton. The balanced black-and-white symmetry features layers of white lattice and trellis highlighting 14 costumes from the Warner Bros. Archive. Also debuting publicly for the first time in 75 years are – Humphrey Bogart and Ingrid Bergman’s costumes worn in the famous, “Here’s looking at you, kid” farewell scene from Casablanca. Humphrey Bogart, Edward G. Robinson and James Cagney costumes pay homage to the Gangster classics. And, the Rebel Without a Cause scene features the book that sparked the story and original costumes. The Classics Made Here tour will be available Fridays and Saturdays at select times beginning May 4 and offered in addition to our Studio Tour (a broad view of both classic and contemporary TV and film) and our Deluxe Tour (providing the ultimate fan experience). Visit wbstudiotour.com to book your tour.